Now you may be thinking to yourself- how does she really know that this works? Well, hopefully I can install some faith into you as I am fully qualified in fake tan application, and am full of information! Note: Best time to apply tan is before you go to bed- it needs 8-10 hours to develop on your skin if it is an instant tan. If not, carry on as per usual! Now you have all your products prepared, we can begin! So prior to any fake tan application, it is vital if you want your tan to look natural, not streaky and last longer, to complete a full body exfoliation before. Why? I'll tell you why. Because every day, your skin will shed a layer of skin, leaving the top layer of your skin (scientifically known as the epidermis!- fact of the day), as dead skin cells. By exfoliating prior to your tan, you are effectivley removing this layer to leave a fresh living and breathing hungry-for-tan layer of skin! The reason why I have said to use a non- oily exfoliator is because the oil from the exfoliator will mix with the tan, sending you green and ogre-like! (imagine turning into shrek) I know this, unfortunately as I was not made aware of this when training, and used an oily exfoliator. Much to my dismay no matter how much tan was applied onto me to try and cover up the green tint, nothing worked. It was a case of scrub, scrub, and more scrubbing! Ouch! Take your chosen moisturiser and squirt/dab/pour a small (bit bigger than a pea) size portion into your fingers and rub together. Take this moisturiser and apply it onto your elbows, wrists, knuckles and fingers, knee caps, ankle bones, and your toes. The reason being is that tan, like makeup, will cling to any dry patches of skin, or areas where the skin is rough or thin and these areas are the prime areas to get orange/patchy disasters. Once you have done this, take your application mit and apply one pump if it's a mousse or one squirt if its a liquid onto the centre of the mit. Starting from the legs downwards, (I usually start on my thighs as there a lot bigger than the rest of my body and it helps me get into the motion of applying tan) apply your tan in circular motions onto the skin. Make sure you have a mirror nearby so you can check for any areas you might have missed. Carry on with this motion all over the legs, down to your feet and ankles. Add more tan to your mit if need be. It is absolutely fine to apply the tan over the kneecaps, toes and ankles etc.. as the moisturiser will prevent a large amount of tan soaking into the skin, therefore letting it look more natural. Don't worry if it is not all rubbing in and looking amazing instantly, you will look patchy when applying the tan but as long as you havent left any areas un- tanned, you will be fine! It will all wash off afterwards leaving the natural, less in-your-face colour! Follow the same procedure for your upper body, I like to start on my stomach and work up towards my chest and neck, and then follow it down my arms and onto my back leaving my face free. Make sure to check, check and check again on your arms for any missed areas as arms/ shoulder area is definitly the most trickiest area to grasp! Face: Now your body is tanned, you can either apply the tan onto your mit to rub into your face, OR what I like to do is take a cotton pad, and apply the tan onto the cotton pad as it is softer on my skin, and then rub onto my face. Another option would be to purchase a tan mit specifically for the face. (which can be found in most shops that sell fake tan and can definitly be purchased online). And VWOLA! you will currently look like a buiscuit, but that does mean that you have done it right! Leave for 8-10 hours before you wash it off and reveal your new outer bronzed goddess!! To maintain your tan: use any of your favourite tan optimiser moisturisers or body polish on a daily basis instead of your normal moisturiserr (if you have one) and your tan should last you and extra few days on top of your hopeful 7 days!! I hope this post has been helpful, I know it was really long but it is detailed and that's important especially if you're a beginner! To remove: The best way to get rid of any bits of unwanted tan would be to exfoliate regularly, like stated above it helps remove the top layer of dead skin cells which will help to break down the tan on your skin. Leave me a comment down below or tweet me @alystephens/instagram me @alystephens and hashtag #StTropezBBG (St Tropez Bronze Beauty Goddess!) 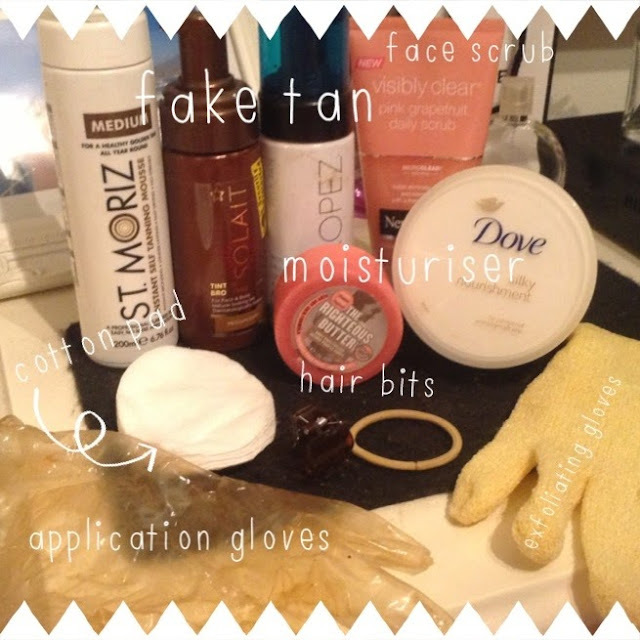 your new bronzed skin and how you found this post helpful or not!